Hold your own community fundraising event or activity or join our Team to Beat and fundraise with our champions! Whether you host a trivia night, sausage sizzle, run a marathon or host a gala ball, community fundraising is a fun and rewarding way to help improve the lives of those affected by heart disease, diabetes and their complications. The impact from your event or participation will not only improve the lives of patients and families, it will unite your local community. Have fun raising funds for the Baker Heart and Diabetes Institute and create an unforgettable and rewarding experience. However you choose to fundraise, we will be there every step of the way to help you along your journey. Have you got what it takes to join the Team to Beat? Join the Baker Institute’s Team to Beat today. Our next challenge will be to take on Run Melbourne’s 5K, 10K or half marathon! Exceed your personal best and raise vital funds for the Institute as you go. 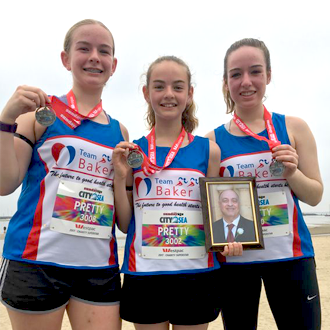 Elyse, Ada and Grace Pretty ran in the 2017 City2Sea to raise awareness and donations for heart disease. Our fundraisers get involved for many reasons. They do it to remember a loved one, or to raise awareness about heart disease and diabetes. They do it for fun, or to get fit and look after their own health. But they all want to make a difference and so can you! 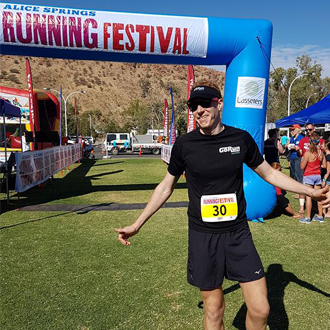 Chris White ran 17 marathons in 2017, what challenge would you take on? Every year individuals, families and community groups fundraise for the Baker Institute, discovering new ways to inspire and amaze us with brilliant ideas and boundless motivation. Contact Myra to start your community fundraising experience today! Receive our "Health Matters" newsletter.